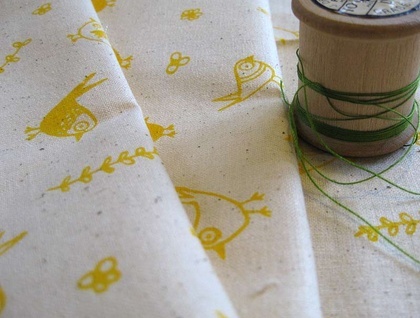 Birds and branches and tiny flowers adorn this fun print. 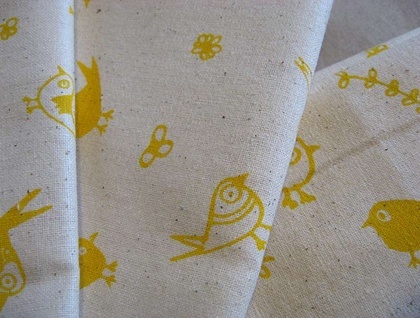 Screen printed in a sunshine yellow ink on to a natural calico cotton, this fabric is perfect for zipper pouches, details on clothing, covering books and all those other small projects. This piece measures approx. 30cm wide and 42cm high - that's around 12" wide and 16" high. 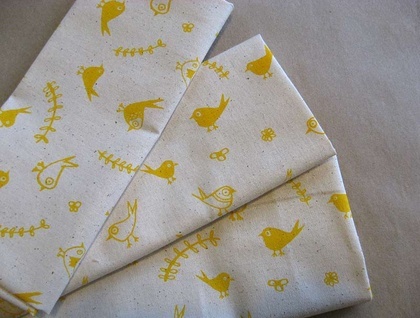 Due to the nature of hand printing slight variations may occur in the print, but this just adds to the charm. Printed in water based inks, the print has been heat set. The fabric is a light to mid weight, and as is it is a natural fabric, please allow for a little shrinkage after the first wash. Contact inmybackyard to enquire about payment or shipping options.